I really didn’t plan on liking this book. I’ve never liked Jubilee very much, and I hate vampires. I thought I would hate this book, in fact I wanted to hate this book. I’m not even sure why I picked it up. Oh right, I have an uncontrollable addiction to comics, well uncontrollable because I refuse to seek any sort of help or treatment. Anyway I actually liked this book, I liked it better than the actual Curse of the Mutants storyline. If you didn’t read Curse of the Mutants I’ll sum it up for you. Jubilee became infected by vampires, the X-Men fought vampires, the X-Men defeated the vampires, but Jubilee is still infected. There I just saved you the trouble of reading five or so issues of a mediocre storyline, although the art was freaking beautiful! So now Jubilee is put into a holding cell until the X-Men figure out what to do with her. Dr. Rao is attempting to treat her vampire urges with blood transfusions from Wolverine that are physically helping, but mentally she is still completely screwed up. So Wolverine steps in to talk with Jubilee and after a heart-to-heart he decides to let her out despite her obvious problems. So now Jubilee has to deal with everyone on Utopia knowing that any minute she could go crazy and kill everyone. So she has to deal with half the population trying to pity her and be her best friend, and the other half ready to drive a stake through her heart. You would think with all the stigma of being a mutant that everyone would have a better idea on how to treat this sort of situation, but the irony seams lost on everyone. The final straw for Jubilee comes when Pixie tries to befriend her, which drives Jubilee off the island and back on the streets of San Francisco. Or a hotel bar in San Francisco where Jubilee meets a lady vampire who offers to show her an alternative to life with the X-Men. The book then shifts to Wolverine and Rockslide scoping out the Port of Oakland in an attempt to find Jubilee. After Wolverine spends some time lecturing Rockslide on his obvious crush on Jubilee Wolverine catches her scent which leads them to a shipping container where inside we see Jubilee covered in blood and about a dozen or so dead bodies. Jubilee just starts chanting that she “didn’t do it” but all Wolverine can do is express his regrets and inject her with a syringe to put her out. Like I said before I had really low expectations for this book, and maybe my low expectations helped. I ended up really enjoying this comic. 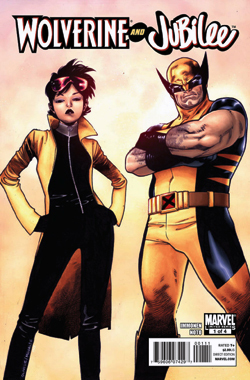 I found it surprising that the majority of the younger mutants treated her so bad, I actually felt bad for Jubilee despite the fact that I never liked her. Kathryn Immonen did a great job writing this book and she knows how to get the reader to sympathize with the characters. Not so big on Phil Noto’s art. I thought Wolverine looked like he was trying to get over a bad hangover the entire time. What I really like about the concept is that it’s tying up a loose end. A problem that I see with X-Men a lot is that since there’s so many characters whenever something happens to one of the “lesser” characters they seem to just disappear. How long have Havok, Polaris, and Marvel Girl been in outer space now? It’s nice to see that someone’s willing to take the time to flush out what’s happening to Jubilee.